How to increase the number of connections accepted by a VMware host system (vCenter) in order to avoid connection timeouts when monitoring such systems with PRTG's VMware sensors? This sensor has not received data for x seconds. Consider distributing your VMware sensors across several probes! If you experience connection failures in your VMware sensors, please change your vCenter settings to accept more connections at the same time. If this is not enough, try spreading your sensors over several (remote) probes. 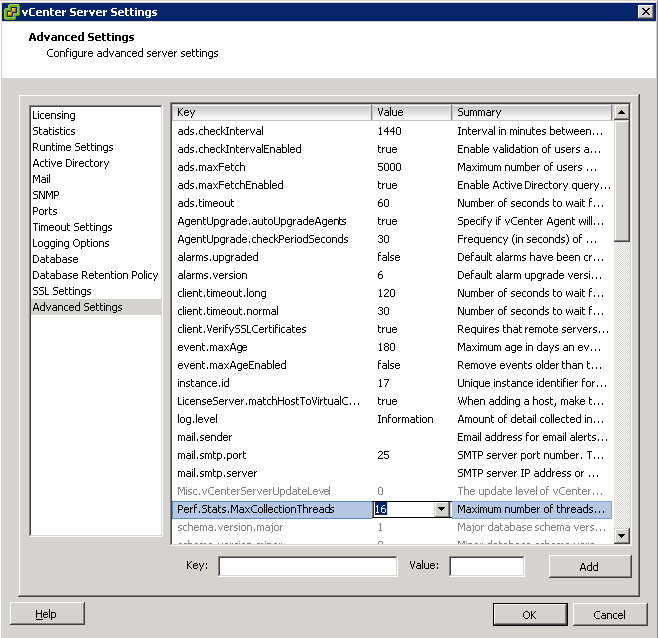 For best performance of VMware sensors, we strongly recommend Windows Server 2012 R2 or later on the computer running the PRTG probe with the VMware sensors. In our tests, Windows Server 2012 R2 or later showed a much better performance for VMware monitoring than other operating systems. A reliability and performance update for .NET Framework 4.0 is available as an optional update (see Microsoft Knowledgebase: Reliability Update 2 for the .NET Framework 4 for details). 30 VMware sensors in a 60 seconds scanning interval if your PRTG server (or remote probe) runs on Windows 2008 R2. Open your vSphere Client settings console from the main menu, select Administration | vCenter Server Settings.... In the Advanced Settings section, change the entry for the key Perf.Stats.MaxCollectionThreads (see screenshots below). The default value is 2. Change it to 16 to allow the maximum of possible synchronous connections. 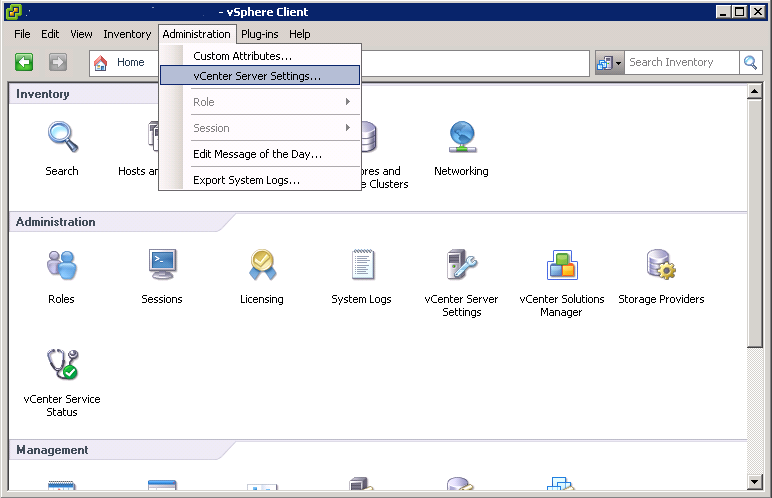 Restart the vCenter Server services to activate the changes! The VMware system counts incoming connections per IP address/machine from which the requests come from. If you spread your VMware sensors over several remote probes, this also helps increase the connection limit. If you're running a cluster setup, remote probes cannot be clustered, and therefore all sensors running on remote probes will not be monitored fail-safely. So, in a cluster setup, we recommend that you add your most important VMware sensors to the Cluster Probe (for fail-safe monitoring), the others to one or more remote probes. When running VMware sensors on the Cluster Probe, each PRTG node in your cluster will create its own connection to the VMware server(s) to query monitoring data. To minimize load we strongly recommend that you use a scanning interval of 5 minutes or more.